So there's a lot of enjoyable historical romance out there if you know where to look. There are some that are really good. And then you have the more rare novels that are truly amazing. This one falls into that last category, I loved every minute of reading it!! And I mean, what wasn't there to like? You had the strong female character who has actual conflict in her past that she's hiding. There was the strong, handsome and very much likeable hero who I instantly adored, even though he did make me go MEN! in the first couple of pages as well. They have amazing chemistry together and there was a whole set of secondary characters for me to love. I mean, what more could I wish for, right? And Julia Quinn definitely had the funny going on! I mean, I love it when there's amazing tension and sexytimes, but for me personally, I couldn't imagine being with someone who couldn't make me laugh and I love it when this also enters into the lovestory. And I just love it when a book makes me giggle! Also, I really appreciated that they didn't immediately jump into bed together. Sure, there's a kiss within 2 minutes of them meeting each other, but they actually form a relationship before taking it further. And I liked that, it seems more realistic to me. But most of all I found that I very much enjoyed Julia Quinn's writing style. The story just seemed to flow effortlessly and I was immediately sucked into this world she's created and found myself genuinely caring about what happened to all of the characters! 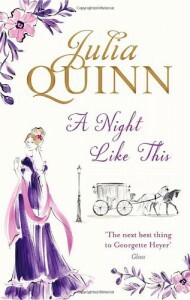 I am so kicking myself for not reading a Julia Quinn novel before!! Seriously, I absolute LOVED A Night Like This and it has made me Julia Quinn's newest fangirl! A Night Like This was everything I could ask for in a historical romance and bonus points for bringing the funny!